The spine provides the main support for body and is the foundation from which the all the motion of the extremities and head is based. It also provides motion for the trunk while protecting the spinal cord and nerves as they pass through the spinal canal and exit into the body. The spine is made up individual bones, or vertebra, which provide structural support, ligaments, discs, and facet joints that connect the vertebra and allow motion, and supporting muscles which stabilize the spine. When viewed from the side (sagittal plane), the spine has an undulating S shaped curve which balances the head and center of gravity over the pelvis while providing th mobility for efficient bipedal locomotion. The s shaped curve is made up of concave cervical and lumbar regions (lordosis) and a convex thoracic region (kyphosis), figure 1. Figure 1. Spinal vertebra, lateral view demonstrating cervical and lumbar lordosis (concave curves) and thoracic kyphosis (concave curve). The normal spine appears straight when viewed “from behind (the frontal plane). Various conditions (degeneration, trauma, inflammation, disease, etc) may alter or “deform” the normal spinal balance producing a spinal deformity. The spine is made up of 33 individual bones: 7 cervical, 12 thoracic, 5 lumbar, and 9 immobile sacral and coccygeal bones which bind the pelvic girdle and provide attachments for the pelvic floor respectively. The bony vertebrae provide for structural support of the body while protecting the spinal cord and nerves that pass through them. 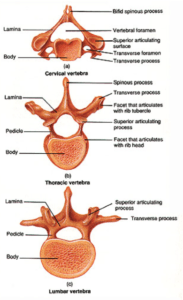 All vertebra are made up of an anterior “body” which bears axial weight under compression; a posterior segment which provides a tethering force under tension and has numerous processes (transverse, spinous, and facet) for the attachment of muscles, ligaments and joints respectively; and a pair of dense strong pedicles which connect the anterior and posterior segments. There are morhphologic variations in response to the functional demands of each region. Figure 2. Basic anatomy of vertebrae seen from an axial (top down) view. Note the morphologic variations of the body, pedicles and posterior depending the functional demands of each region. The cervical spine has the greatest range of motion largely due to the unique features of the first two vertebrae (C1 and C2). C1 is shaped like a ring and allows much of the up and down motion of nodding. It also rotates around the peg like extension of C2 providing for much of the necks turning motion. 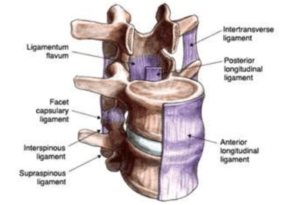 The lumbar vertebra are much larger so that they can bear the weight of the body with large sagittally aligned facet joints to provide mobility. The thoracic vertebra are intermediate in size, have attachments for ribs which protect the heart and lungs, and have very limited mobility. The vertebrae are connected to one another by a disc and two facet joints which allow for segmental motion while providing stability. The disc is made up a central nucleus that behaves like a shock absorbing sponge resisting axial loads under compression and a peripheral annulus that firmly binds the vertebrae together and resists torsional loads. Posteriorly, the inferior articular process of the upper vertebra connects to the superior articular process of the lower vertebra forming bilateral facet joints (figures 3 and 4). Sagittal facet alignment allows for more flexion/extension while coronal alignment more rotation. The disc and two facet joints connecting two vertebrae are considered a motion segment. Figures 3 and 4. Demonstrate the inner nucleus pulposis (NP) and outer annulus fibrosis(AF) of the disc and the disc and facet joints in motion. The vertebrae are bound together by a group of ligaments that provide strength against tensile forces. There is a thick ligament that runs the length of the front of the vertebral bodies (anterior longitudinal ligament) resisting extension forces, interspinous ligaments between each spinous process resisting flexion forces, and a ligament running down the posterior border of the vertebral bodies called the posterior longitudinal ligament. The capsular ligament connecting facet joints, the facet joints themselves, and the annular ligament of the disc provide most of the resistance to rotational forces (figure 5). Figure 5. Major spinal ligaments: ALL, PLL, ISL and capsular ligaments. There are numerous muscles that provide motion and postural stabilization of the spine. These include 3 layers of deep “intrinsic” muscles which run longitudinally along the length of the posterior spinal column(erector spinae, multifidus, and intertransversalis). These assist primarily with rotation and extension of the spine. Anterior cervical muscles, lumbar psoas, and abdominal muscles assist with rotation and flexion based activities. In addition the abdominal “core” muscles create an anterior hydrostatic column that further protects against flexion based forces and axial loading. Strong, healthy, and conditioned muscle “core” is important in protecting the spine from injury, especially as degenerative changes accrue with age. Figure 6. Axial view of lumbar spine muscle: Psoas, quadratus, and abdominal muscles anteriorly and the deep intrinsic extensors posteriorly. The spinal cord passes from the brainstem through the spinal canal to the level of the upper lumbar spine. There are 31 pairs of spinal nerves that branch off the cord and pass through foramen to enter the body. These nerves function like telephone lines sending information back and forth between the central nervous system (brain and spinal cord) and the body. 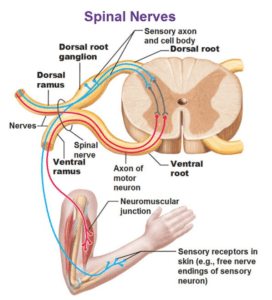 Each nerve is made up a ventral root that carries motor signals from the central nervous system, or CNS (brain and spinal cord) to the body and a dorsal root that carries sensory information from the body to the CNS. The roots then join together to form a spinal nerve before they exit the spinal canal through foramen where they divide into an anterior and posterior branche supplying the ventral and dorsal portions of the body respectively. Each “branch” conveys both motor and sensory information in a specific and predictable myotomal (muscle) and dermatomal (skin) pattern respectively. Figure 7. Spinal nerve. Demonstrates ventral (motor) and dorsal (sensory) roots forming spinal nerve before branching into peripheral dorsal and ventral rami which innervate the posterior and anterior parts of the body respectively. The spinal cord and brain are covered by three membranes called the pia mater, the arachnoid, and the dura. Cerebral spinal fluid baths the CNS in the layer between the arachnoid and pia mater layers (subarachnoid space) while the blood vessels pass through the epidural space which is between the dura mater and vertebra. Once the nerves exit the spine they are wrapped in an insulating layer of myelin which protects the nerve and facilitates signal conduction. Figure 8. Axial view demonstrating the 3 meningeal layers: deep pia mater, arachnoid mater, and dura materThe cerebrospinal fluid reside in the subarachnoid space while the blood vessels passes through the epidural space between the vertebra and dura mater.